Offering you a complete choice of products which include S Type Two Channel Data Loggers, T Type Two Channel Data Loggers, K Type Two Channel Data Loggers, R Type Two Channel Data Loggers and J Type Two Channel Data Logger. We offer To Our valuable Clients Two channel data logger with S type sensors. These S type two channel data logger is usable from 0 to 1482ºC, (32 to 2700ºF). Easily contaminated. It takes directly two inputs like RTD Thermocouple. These T Type Two channel data loggers take directly two T type thermocouple inputs. These T Type Are protected by compacted mineral insulation and appropriate outer sheath, Type T data logger Is Usable from 0to 350º C, (32 to 662º). Type t is very stable and is used in a wide variety of cryogenic and low temperature applications. We are Leading Manufacturer and Exporter for our quality assurance products. Our K Type Two Channel Data Loggers takes two K type thermocouple inputs. K type usally work in most application as they are nickel based and exhibit good corrosion resistance. It is Most common sensor calibration Type providing the widest operating Temperature range. Ajinkya Electronic Systems are highly known manufacturer for our quality assurance products served to our clients on time with quality in our industry. These R types sensors are protected by compacted mineral insulation and appropriate outer sheath, R type data logger is usable from 0 to 1482ºC, (32 to 2700ºF) Easily contaminated. 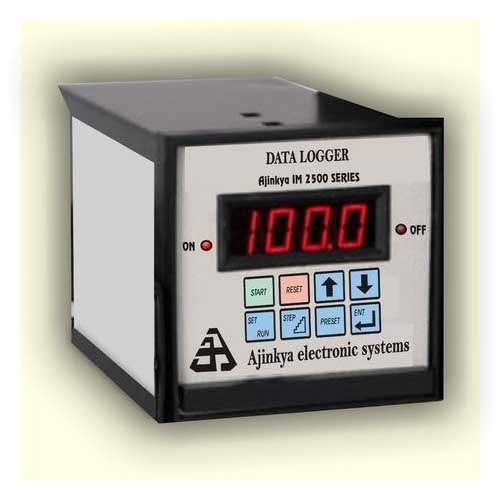 Ajinkya Electronic systems Manages to manufacture and Export wide range of Data Loggers. In which J Type Two channel Data Logger takes two J type themocouple inputs. J type sensor when protected by compacted mineral insulation and Appropriate outer sheath, Type J Data logger is useable from 0 to 816º C, (32 to 1500ºF).